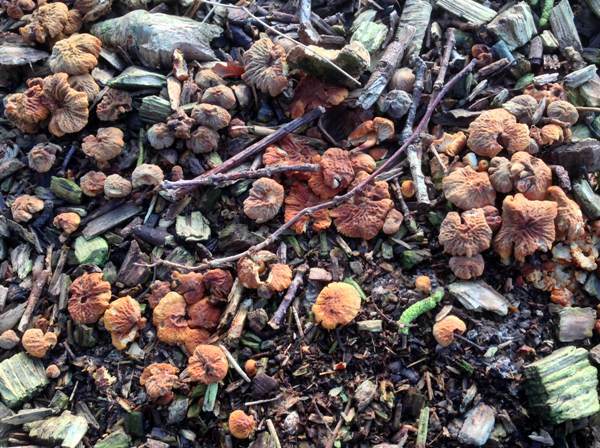 These colourful fungi and puckered fungi are very rare finds in Britain and Ireland. From the few collections that have so far been recorded on the FRDBI, it seems that these striking powdercap mushrooms are quite gregarious. The lovely specimens shown on this page were found growing on wood chip in Somerset, England. A very rare find in England, Wales, Scotland and Ireland, this powdercap mushroom is also recorded very occasionally in some other northern European countries. 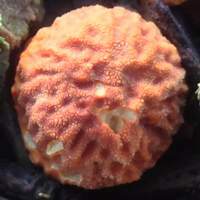 When Peter Orton described this species in 1960 he gave it the scientific name Cystoderma simulatum, which is the name by which it is still known today. Powdercaps usually do have granular cap surfaces - the generic name Cystoderma means 'blistered skin' - but their most distinctive feature is the marked contrast between the smoothness of the stem above the ring and its scaly surface below. The overall impression is of a mushroom wearing an ill-fitting stocking. The specific epithet simulatum comes from the Latin verb simulare, which means 'to fake' oir 'to pretend'. 0.5 to 2.5cm across; initially convex, becoming broadly convex or flattened with age, often developing an irregularly-lobed margin; surface wrinkled and pruinose; colour brick red, orange or tawny-orange, pruinose/finely granulose. 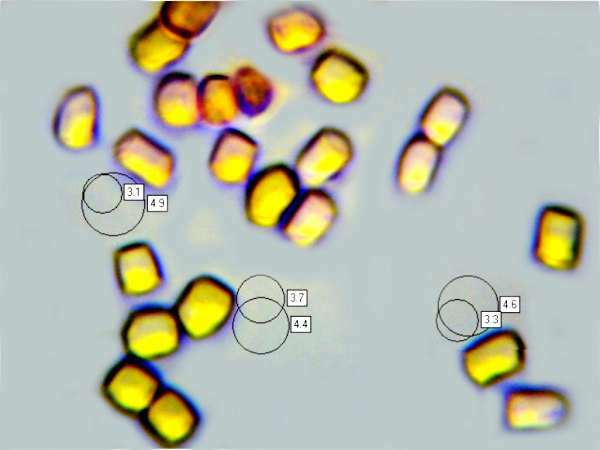 In the cap context immediately below the pileipellis, rectangular asexual reproductive cells, known as arthroconidia or arthrospores, form as the mushroom matures. 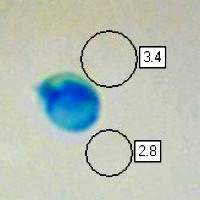 The photomicrograph on the left shows arthroconidia 3.5-5 x 2.5-4μm in the cap context below the cuticle of Cystoderma simulatum. Adnate or very slightly decurrent; crowded; white at first, becoming yellowish with age. 1.5 to 4cm long and 2.5 to 4mm diameter; colour as cap; smoothish above a poorly-defined ring zone, scaly below; cylindrical, base often slightly bulbous. Ellipsoidal to subglobose, smooth, 3.5-5 x 2.5-3.5 μm; amyloid. No significant odour or taste. 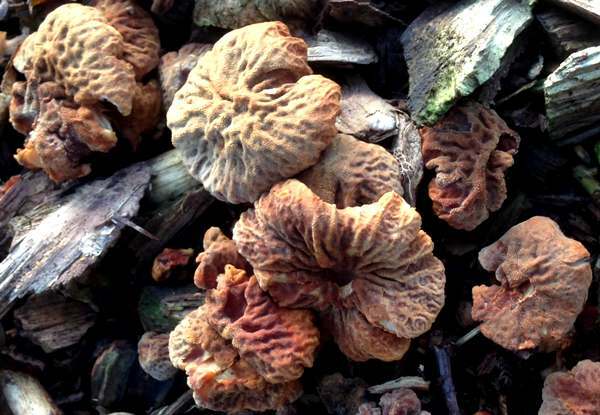 Saprobic, on dead wood, usually well rotted, such as wood-chip mulch or fallen Elder trunks and branches. Five Cystoderma species are known to occur in Britain and Ireland but all are uncommon or rare except for Cystoderma amianthinum, which grows on soil, usually in mossy grassland, and has a powdery orange cap that is rarely wrinkled. 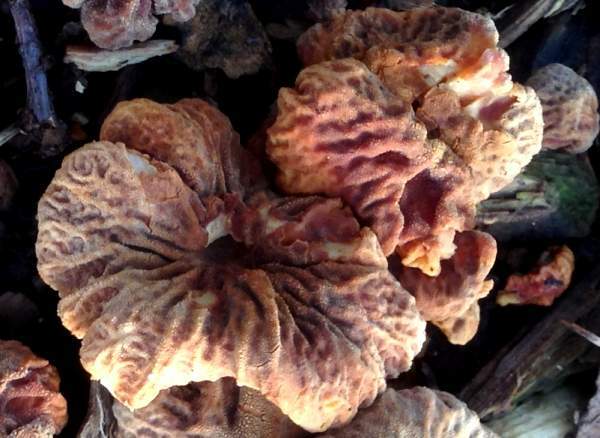 Microscopic study is necessary to identify Cystoderma fungi to species level with certainty. All parts of a mushroom are made of hyphae, which are usually in the form of tube-like structures, often in sections separated by walls known as septae. Hyphae are much finer than a human hair and so only visible under a high-powered microscope. 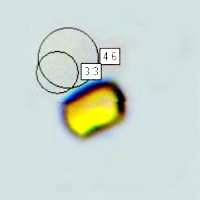 In some kinds of fungi, as the fruitbodies mature these hyphae become modified to form asexual spores. Arthrospores (also known as arthroconidia) are formed by fragmentation of septate hyphae into single cells. In the genus Cystoderma, two British species are kinown to produce arthrospores; Cystoderma simulatum is one, and the other is Cystoderma jasonis, which produces larger ascospores and larger arthrospores than C. simulatum. 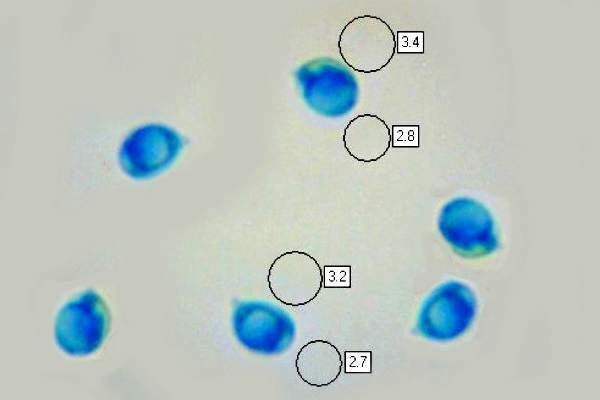 Conidial (asexual) spores are produced by some other basidiomycetes. 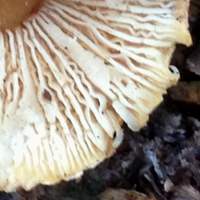 For example the caps of Powdery Piggyback Asterophora lycoperdioides, which grow on old Russula fruitbodies, produce (sexual) ascospores via basidia on their gills and then the cap surface breaks up into a mass of brown (asexual) clamydospores. Cystoderma mushrooms are generally considered inedible, and there is speculation that at least some species in this genus may be toxic. Simon Harding & Geoffrey Kibby (2016) Fungal Portrait No. 67: Cystoderma simulatum, in Field Mycology July 2016; British Mycological Society. Breitenbach, J & Kränzlin, F. (1995). Fungi of Switzerland Vol. 4; Mykologia Lucerne. Funga Nordica Vol. 2: 617–620. ed. Knudsen & Vesterholt; Nordsvamp, Copenhagen. Taxonomic history and synonym information on these pages is drawn from many sources but in particular from the British Mycological Society's GB Checklist of Fungi and (for basidiomycetes) Kew's Checklist of the British & Irish Basidiomycota.